It's an interesting thing about honey and beeswax: the more they grow in popularity, the fewer honeybees exist to produce them. That's what makes beekeeping such a valuable enterprise, and it's good to know that with just a starter colony, a vigorous queen honeybee and a small investment in beekeeping supplies, anyone can reap the rewards of running a honeybee farm. Wild Creek Bee Farm's offering of live honeybees for sale includes both hand-bred breeder queens and over-wintered, Northern-bred five-frame nucleus colonies, and you can believe we're fussy. Before we even consider offering any colonies or queen bees for sale, we carefully select them for cleanliness, temperament and skill at honey production. 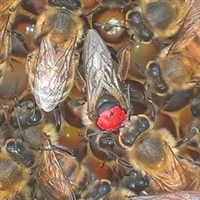 When you purchase your breeding stock from Wild Creek Bee Farm, you'll know you've purchased the best.